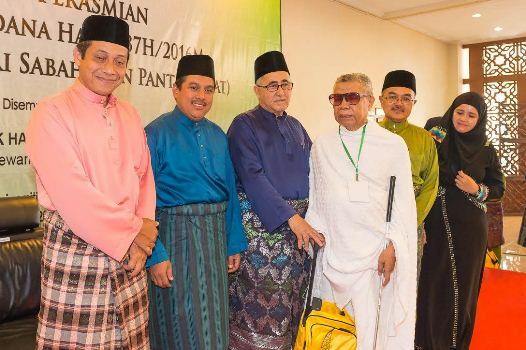 WEDNESDAY, 20 JULY – 584 pilgrims attended the 1437H/2016M Hajj Course, State-level West Coast Zone, jointly organised by the Malaysian Hajj Pilgrims Fund Board (TH) and Universiti Malaysia Sabah (UMS), recently. The course was officiated by the State Assembly Speaker, Datuk Haji Syed Abas Syed Ali. In his speech he congratulated TH for their commitment in ensuring all programmes and activities for the pilgrims were successfully implemented. He advised the pilgrims to stay healthy and to bring enough medical supplies as the hajj required physical strength, especially during the Arafah, Muzdalifah and the stoning of the devil at Jamrah. According to one of the pilgrims, Sahara Jais, 43, the Hajj Course was important as it gave them an idea of the situation at the holy land, so as to be better prepared. “This is the first time I will be performing the hajj to the holy land, I am very happy and grateful for having been chosen to join this course,” Sahara said, who hailed from Kg. Gudon.